This fantastic 1 bedroom apartment is located in the heart of Ayia Napa. It is within easy walking distance to the beach and resort centre with an abundance of restaurants and shops. 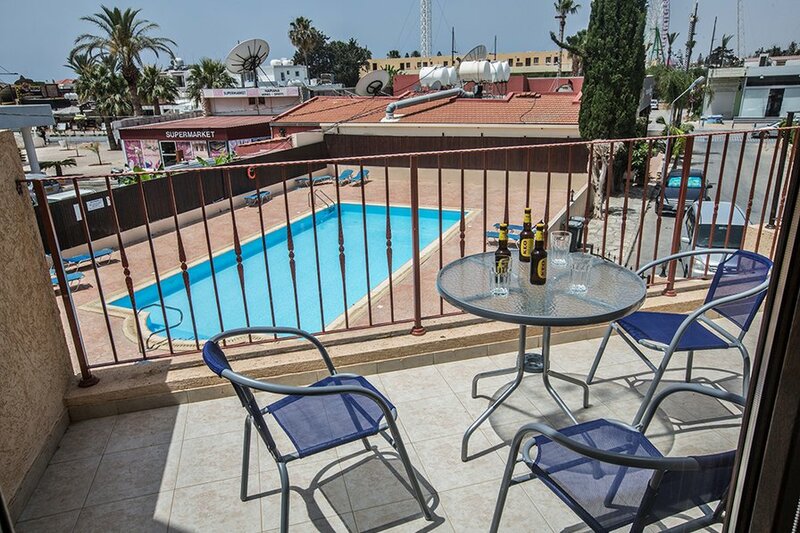 This fantastic 1 bedroom apartment is located in the heart of Ayia Napa. It is within easy walking distance to the beach and resort centre with an abundance of restaurants and shops. The Ayia Napa square is less than 5 minutes walk away. The apartment is the perfect choice if you want to be close to all the amenities of the resort, without the need for transport. The apartment is modern, spacious and fully furnished with everything required for a comfortable stay. It features an open plan living, dining and kitchen area with a balcony that overlooks the pool area. The bedroom has a double bed and a sofa bed and there is a family bathroom with bath and overhead shower. Free WIFI and satellite TV are available and the apartment has air-conditioning throughout. Outside you will be able to make full use of the communal pool.There is also the option of breakfast or meal (not included on price – arranged on site) where you are able to dine at the well-established Napa Star. Overall, a lovely 1 bedroom apartment in a superb central location ideal for a fun-filled holiday.